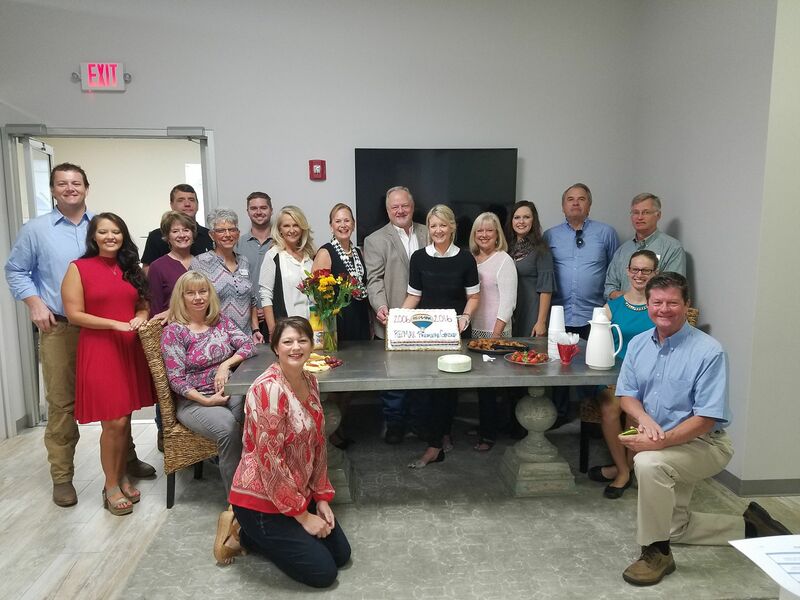 This week RE/MAX Premiere Group celebrated our 10th anniversary! Over this last decade, we’ve had the honor of bringing uninterrupted service to West Alabama. We’ve shared special moments in the lives of our clients, like becoming first time homeowners. And we’ve shared special moments together in our own lives. As we celebrated with cake, we reflected back on our journey we wanted to take a minute to share our story. Our beginning goes back further than 2006 though. To get to the beginning we need to start in 1997. 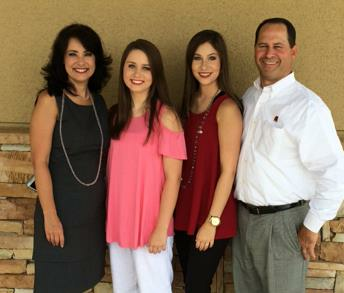 Phyllis Olive and Johanna Shirley joined RE/MAX when it first came to Tuscaloosa. After several years, the current broker announced he would not be renewing his franchise, leaving them as a local, independent company. A month after that announcement, Ken, Phyllis, and Johanna purchased their own RE/MAX franchise, which would become RE/MAX Premiere Group. The three opened a brand new office with a team of 14 agents. Just a year later, we continued to experience tremendous growth, so we purchased a new office space on McFarland Boulevard in Northport. In 2013, Ken became the sole owner of the RE/MAX Premiere Group franchise. Since then , he has grown the company to 25 agents, and relocated the company to a beautiful new office in the Northridge Shopping Center. Ken was named the RE/MAX Dixie Regions Broker/Owner of the Year and Recruiter of the Year in 2015. All of us at RE/MAX Premiere Group want to thank our clients and community for helping us reach this milestone. Without your business we would not be here today. We are as committed today as we were ten years ago to be the most trusted and prepared agents to serve you. Thank you again and we look forward to what the future has in store! REAL ESTATE FACT OR FICTION? WHAT ABOUT EARNEST MONEY? Earnest money is an advance payment buyers make against the purchase of properties that is made at the time of the offer and not later than offer acceptance. Earnest money is legally required. The offering of earnest money is a conventional and customary practice that is considered a part of making an offer to purchase property. The amount of earnest money reflects the financial sincerity of buyers. It shows sellers that buyers have cash available to purchase property. There is no law requiring buyers to place any of their money at risk at the time of making an offer or offer acceptance. At the same time, there is no law that requires sellers to accept an offer to purchase property if earnest money is not promised in the offer. However, there are laws that govern the handling of earnest money by third party real estate agencies. The amount of earnest money is negotiable between the buyers and sellers. There is nothing written anywhere that governs how much earnest money buyers must advance at the time of making an offer or offer acceptance. Because there is an element of risk in advancing earnest money for an agreement that may take 30 to 45 days to consummate, most buyers like to offer smaller amounts of earnest money. Sellers, however, because they are going to risk entering an agreement with buyers, and take their properties off the market for a considerable period to time to enter escrow with buyers, prefer higher amounts of earnest money to do so. This is a way for sellers to qualify a buyers’ sincerity before taking homes off the market for buyers. One way or another, the final amount is subject to an agreement between buyers and sellers. When buyers back out of agreements sellers automatically get the earnest money. Alabama law is specific on the rules for handling earnest money when it is collected by real estate agencies. Not quite so when real estate agencies are not involved. Simply put, agencies holding earnest money may not pay earnest money to either buyers or sellers without both parties’ written approval. Even when written agreements call for situations that allow buyers to receive earnest money without buying the property, the holding agency may not pay to sellers or to buyers without the other parties’ written approval. The normal life of earnest money is to sit in an agencies’ escrow account until the day of closing at which time it is paid to the title company closing the loan, added into all the proceeds brought to the table to finalize real estate agreements and close real estate loans, and transfer titles of properties to new owners. Thank you to agent, Jack Ryan for explaining the ins and outs of Earnest Money with us! You can also find him on Facebook and Twitter. You can view his listings by clicking here or call him at (205) 886-0187. There’s a fresh face around the RE/MAX Premiere Group office as of late. Alex Hayes, a 24-year old Tuscaloosa native is the new Office Assistant. Alex is responsible for helping to make sure things run smoothly on a day-to-basis, and his duties include shredding, stocking of office supplies and materials, as well as preparing mail to go out. 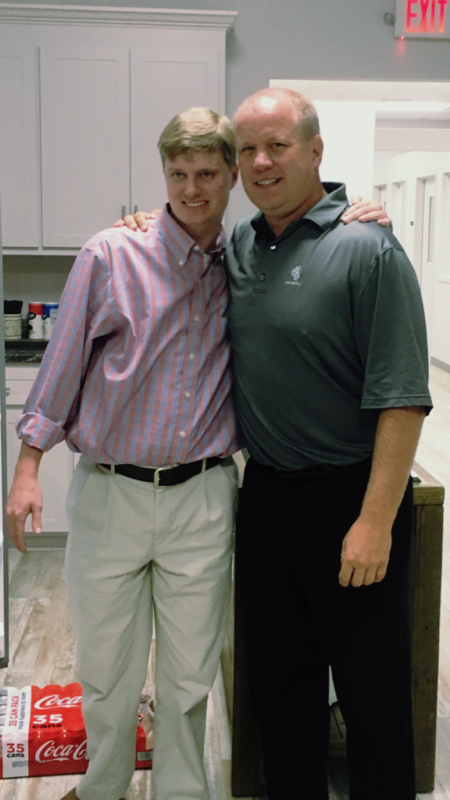 Alex, a Northridge High School graduate, comes to us via the “Start on Success,” United Cerebral Palsy of West Alabama’s (UCP) Supported Employment Program. “Start on Success” is directed by Mrs. Becci Hauser, who is also providing Alex with job coaching support as part of his new role with the Premiere Group. UCP provides job development, placement and job training to individuals with disabilities in the community through the “Start on Success” program. 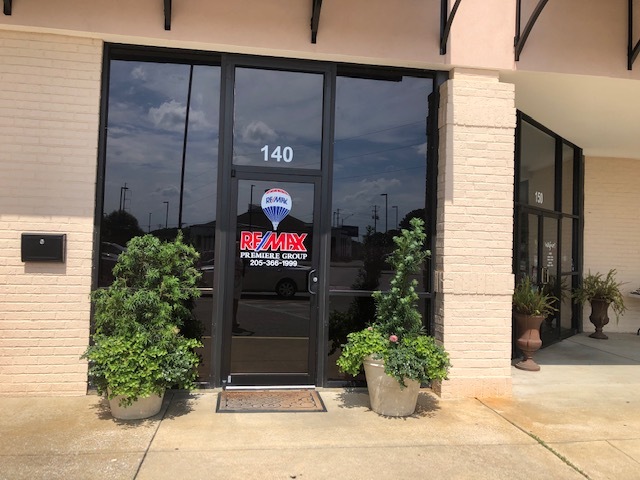 “The best part about this, is the people at RE/MAX, don't think they are doing anything special,” Becci said of RE/MAX’s participation in the “Start on Success” program. “Tuscaloosa is the most supportive city in Alabama. You won't meet anyone who doesn't want to help others, especially those with autism or other disabilities. But actually giving the support and time it takes for them to be successful, is not always possible. I want to assure Alex's co-workers, they are really special,” she said. This is Alex’s first job, and we’re delighted to have him on our team. Receiving his first paycheck has been the most memorable moment for him. Jeff and Anita Hayes, Alex’s parents say he has gained a great sense of pride and confidence by being able to go to work. “We appreciate RE/MAX participating in the Start on Success program and encourage other employers to do the same,” they said. We are committed to serving our community in any way possible, and are honored to work with UCP to provide employment opportunities to those in the “Start on Success” Program. We’re looking forward to growing this partnership with UCP, and are excited for what the future holds! So you want to buy a new home? Or a new condo? Or some land to eventually build a home? There are different buyers out there just like there are different sellers. However, they all share the same thing in common - purchasing can be a confusing challenge. There are countless websites, magazines, and Twitter accounts out there all dishing out information. What we want to do is take a step back, and offer you the number one piece of information you need to know. "Before visiting the first home for sale, establish your ability to buy a home. Visit a lender and share all your financial information. Allow them to check your credit history and credit score to find your middle credit score. Your debt, income and credit history and credit score will determine if they can loan you money, how much money they can loan you, and what type of loans you may qualify for. If they can't make you a loan, they will tell what you must do to qualify for a loan in the future. If they can make you a loan, they will tell you the maximum loan amount you are eligible for. This amount, combined with any cash you have for a down payment will tell you the price range you should stick to when shopping for homes. Stick to homes in that price range. If those homes are not acceptable, then ask your lender what you must do to qualify for homes in higher price ranges." The name of the game is knowing your limits, and then partnering with a smart and trustworthy agent who will expertly guide you throughout the buying process. After you've met with a lender and established a budget, Jack suggests following his list below to ensure you don't jeopardize your chances once you've been approved for a loan. When planning to buy a home these 5 actions can possibly result in loan denial. You must ABSOLUTELY NOT do any of these once your loan is approved and you are waiting to close on your loan. Are you currently looking to buy a home in the Tuscaloosa area? Maybe you aren't sure where to go to speak to a lender and need a recommendation you can trust. Give us a call at 205-366-1999. One of our agents can speak with you and tell you of reputable companies in the area you can trust with your and your families plans. 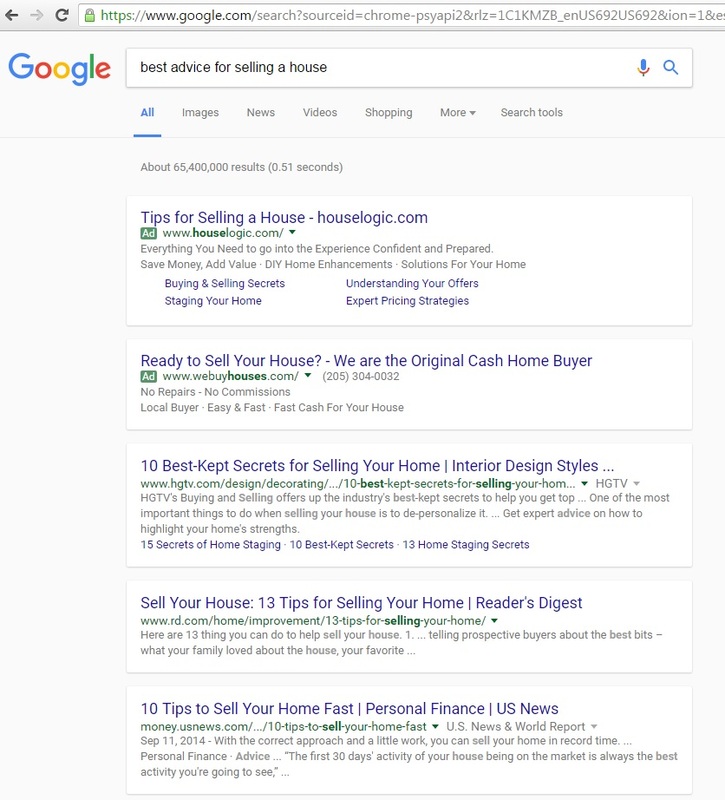 If you were to search "Best Advice For Selling A House" Google would give you over sixty-five million results. Yes, MILLION. Don't believe us, then try it yourself, or better yet, just see this picture we're posting below. With so many results, and people saying "do this" or "try that" it can't get overwhelming. That's why we want to offer you the number one piece of advice you need to know. This tip comes courtesy of Jack Ryan, a member of our team and an agent with a strong track record of helping people just like you sell their home. "Price your home according to the recent prices in your location. This is called pricing at the sweet spot. Then stick to your price when negotiating. Buyers will pay full list price for a fairly priced home. When choosing the price it must also be compatible to the condition of your home. The better the condition of your home the better your ability to price at fair market value. Do not price higher on the premise that you will come down during negotiations. That is called over pricing your home and will attract buyers able to pay more than your home is worth. They will see you have overpriced your home and go buy another home that is fairly priced. Meanwhile, buyers who can pay what your home is really worth will not visit because you have told them the house is out of their price range. Homes priced at market value sell faster and for a higher price. Overpriced homes do not sell quickly, accumulate too many days on market, arouse suspicion among buyers, and often sell for less than they are worth." Our team of trusted agents know the Tuscaloosa area and our eye is always on the market. Don't just leave your listing price up to chance. Call us today and speak with us to establish a game plan. We want to see you get the fair price and be your support along the way. We will not only help you determine what your home is worth, but then work tirelessly to find the right buyer for your home. You can reach us at 205-366-1999 or visit tuscaloosapremieregroup.com to learn more. We look forward to going to work for you! Sales Associate Andrew Gore in our Agent Spotlight post. Q. Tell me how you first got involved in real estate? own as a full-time agent. Q. What has surprised you most about working in real estate? showing lake property, the next day walking through woods touring land for sale. Q. What do you find most challenging about your job? to get to the closing table. Q. Tell me about someone who has been a big influence in your life? advice, and always keep me focused on the positive. Q. What’s it like to be a member of the RE/MAX Premiere Group team? that makes our jobs easy. Q. If you weren't a real estate agent, what would you be doing instead? Q. Do you have a favorite quote or philosophy that you live by? A. "The distance between success and failure can only be measured by one's desire." Q. How would (someone) describe you? A. Hard working, conservative, loyal, honest and respectful. met or exceeded that resolution so far. Q. What is your favorite thing about living in the Tuscaloosa area? amphitheater. We have Lake Tuscaloosa that offers a variety of watersports and fishing. There is always a sporting event to attend at UA. Great hunting is within an hour, and the beach is only 4 hours away. This week on The Premiere Blog we spend some time getting to know RE/MAX Premiere Group REALTOR Pam Houston Sanford in our Agent Spotlight post. A. I got my real esate license in 1989. I was interested very early and began selling homes at the age of 22. It's all I have ever done and prior to selling full time I worked part time and was a leasing agent for Alexander Rentals, which was campus properties mostly. A. The thing that has surprised me the most is how long it took to have people you do not know call you to list for them based on your name only. A. The most challenging part of my job is not worrying about my clients and their situations, if their home will sale? If they will be happy? If their children will like their new school etc. I seem to stay very deeply concerned with so much that I cannot control. I am getting much better though. A. I have had many good influences in my life but my husband and his support of me has been a huge part of my success. You can't do this business without a person understanding a very crazy schedule and many demands on your time. My mother as well, because without her helping me out when our children were little , I couldn't of made it. Q. What might (someone) be surprised to know about you? A. You might be surprised to know that I love to teach and I feel most comfortable when I am asked to speak in public. (CRAZY I KNOW) I love to teach young people because I think they are brilliant and their young minds are like a sponge, they soak up everything and if you give them something good and it helps them. WHAT A REWARD? A. I love Re/Max, especially those in my office with whom I am blessed to work around on a daily basis, from the staff to my fellow agents, I wouldn't hesitate to call any one of them to help me and I would help any one of them as well. A. If I wasn't a real estate agent, I would be a motivational speaker for today's youth! Trying to urge them to realize that they can do more than they think they can and that where you start has nothing to do with where you will finish! A. What goes around comes back around. My daddy said it and I believe it. I also try to treat people as though it's between me and the Lord and not between me and them. This helps me out when I'm in traffic and encounter a slow car in the fast lane. A. I enjoy having friends over to eat and socialize, I love the lake and all water sports, the beach, Alabama Football and any sporting event where I know anyone playing no matter who it is. Any activity that I can do with my family and friends, I enjoy. A. I love that all 4 of my brothers and their families live here and we are a close family, I love the Crimson Tide, I love that I grew up here, I love the lake and the short distance to the beach. This week on The Premiere Blog we spend some time getting to know RE/MAX Premiere Group REALTOR Dana H. Oglesby in our Agent Spotlight post. Q. If not originally from the Tuscaloosa area, what brought you here? A. Born and raised in Tuscaloosa. I have never lived anywhere else. A. Dana Hartley Oglesby grew up in the Tuscaloosa area and started working at age sixteen in apparel retail sales. For twenty-five years, she enjoyed working in that form of sales. After undergoing dramatic adjustments in her life, at age forty, she was faced with rebuilding her life and raising her two then teenage boys, Blake and Brock, alone. 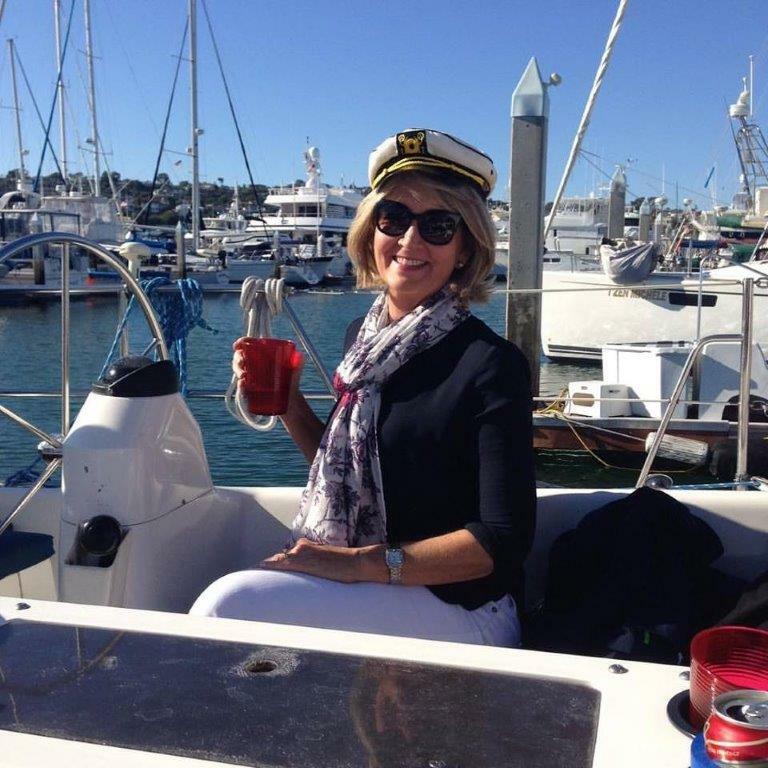 In January of 2005, Dana began her rewarding career as a residential realtor in the fast paced real estate business. However, a couple of years after Dana began her career, the real estate industry went through one of the hardest times in U.S. history. Dana not only survived but succeeded with her determination to provide for her sons, her dedication to hard work and her complete faith in God. 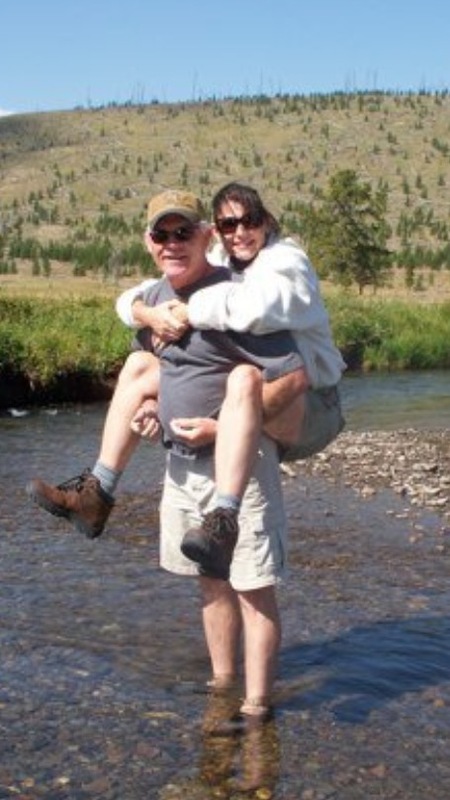 Despite life’s setbacks, along with her faith, her optimistic outlook gives her the ability to view life as continually changing for the better and in 2013, she married Randy Oglesby. Along with her two sons, she feels blessed to have her stepson, Kyle, stepdaughter, Anna and her husband, Andrew, as part of the family as well. In 2015, her eldest son, Blake, married Kaleigh and also, Anna and Andrew welcomed the arrival of their daughter, Emma. A. How different each transaction is. No two have ever been alike. I learn something new from each house I sell. A. My parents both were Christian loving parents. They taught me to always tell the truth and hard work pays off. A. I love the TV show "I Love Lucy!" A. Helpful, friendly, fun, hardworking, with high work ethics and always striving to be professional. A. I worked for 25 years in fashion retail and I would still be doing it if I could have supported my boys. Starting my real estate business was the best professional decision I ever made. A. Say what you mean and mean what you say. A. I hope they would first say she is Christian, honest, hard working, loving person. A. Gardening, enjoy family and friends, traveling anywhere in the USA. A. I love the Southern culture. I love the size; it's small but big enough to offer lots of opportunities. I enjoy Lake Tuscaloosa and walking along Black Warrior River. I have never lived anywhere else - it's home! Mrs. Doubtfire with Robin Williams... it's fun, painful, healing - it's life! This week on The Premiere Blog we spend some time getting to know RE/MAX Premiere Group Associate Broker Phyllis Olive in our Agent Spotlight post. A. My husband and a few friends told me I should sell real estate. My kids were growing up and I decided to try it. A. It's really not just about houses. It's so much more. A. Biggest challenge is making everyone happy. I put that pressure on myself. A. Might be surprised to know I don't like to shop. Especially for clothes. I don't like all the decisions. And it's time- consuming. A. Working at RE/MAX is very rewarding. I love seeing our agents achieve more. A. Philosophy - what my parents taught me.....Be kind to people especially those less fortunate. Work hard. A. When I'm not working you can find me having coffee or drinks with friends or relaxing with Ken. I like to read and bike. A. Favorite thing about Ttown. Other than the Crimson Tide I love our location. We are a weekend away from Atlanta, the beach, the mountains or New Orleans. No flying! You can find Phyllis on Facebook: Phyllis Olive, Tuscaloosa REALTOR, RE/MAX Premiere Group and on Instagram: @PhyllisOlive. To see Phyllis' listings or to learn how she can help meet your real estate needs visit her website or call (205)-310-0448. This week on The Premiere Blog we spend some time getting to know RE/MAX Premiere Group Sales Associate Jack Ryan in our first Agent Spotlight post. A. Recruited to work in UA Athletic Program in 1981. Worked there until 1992. A. Carlton Sheets buy real estate no money down. It actually worked back in the 90’s, I bought three homes no money down. A. How hard it is to be successful. A. Finding ways to do my job even better than I do it now. A. Eleanor Roosevelt. Boy could we use her vision and philosophy in this country today. A. Working for the CIA or a Navy Seal Team. A. The best way to get what you want out of life is to help others get what they want. Q. How would (someone) ( who knows me) describe you? A. A loyal friend and a formidable opponent. A. Probably working. Just kidding, Madly in love with my dog, grandchildren and family. Usually spending time with them when I am not at work. A. I can leave 15 minutes before I have to be there and usually arrive early. You can find Jack on Facebook: Jack Ryan Homes and on Twitter: @JackRyanHomes. To see Jack's listings or to learn how he can help meet your real estate needs visit his website or call (205) 886-0187.